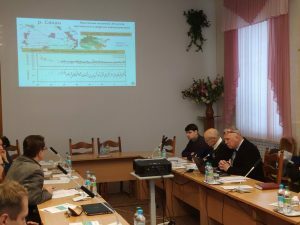 The National Ecological Center of Ukraine (NECU) organized a roundtable discussion about “Natural Values of Polesia and Environmental Threats of the E40 Inland Waterway (E40 IWW)” in the Conference Hall of the National Academy of Sciences of Ukraine on 26th December, 2018. The event was attended by representatives of the Parliament of Ukraine, the Ministry of Environmental Protection, State Water Resources Agency, State Ecological Inspection, State Administration of the Chernobyl Exclusion Zone and several non-government environmental organizations. Heorhiy Veremiychyk, NECU’s expert on climate change briefed the round table participants on the current state of the development of the E40 IWW, with special attention to the position of the international coalition of environmental organizations that believe that the project is not only a huge threat to the environment, but does not have economic rationale. In case of implementation of the E40 IWW, the Pripyat River will lose its natural state and the outstanding biodiversity value of Polesia will be destroyed. Ruslan Havryliuk, head of NECU also emphasized that the European Union integration of Ukraine cannot be realized without preserving the environment, which is confirmed through the Association Agreement signed between Ukraine and EU. This agreement requires Ukraine to adopt the 2 nature directives and the water framework directive, which also calls for public consultation in relation to investments impacting Ukrainian rivers. Mykhailo Borysiuk, the head of the Secretariat of the Committee of the Parliament of Ukraine on Environmental Policy, Natural Resources and the Elimination of the Consequences of the Chernobyl Catastrophe stressed that the further planning of E40 Inland Waterway requires wide discussion and informed decisions. It was emphasized that the potential benefits of the E40 IWW will be realised by a few individuals, while most of the investment costs, as well as possible additional costs associated with, for example, the degradation of river ecosystems, will be imposed on society as a whole in the three countries of Belarus, Poland and Ukraine. A comprehensive strategic environmental assessment of the E40 Project (for the entire water route) has to be completed, considering the transboundary impact of construction works and the functioning of the waterway. At the same time, it is necessary to fulfill the commitments undertaken by Ukraine to protect valuable natural territories of European significance, which are part of the emerald network of Europe, and thus avoid reputational losses of the country. Oleksandr Husiev from NECU presented an overview of the threats posed by the implementation of the E40 project for territories adjacent to the Chernobyl exclusion zone. For instance Leonid Protsenko head of the “Intercocenter” NGO noted that after the Chernobyl disaster the exclusion zone was very contaminated with radioactive elements, therefore the construction of the international waterway E40 should be preceded by a thorough investigation of the potential threats of re-contamination of the waters of the Pripyat and the Kiev lake. The representative of the Ministry of Environmental Protection of Ukraine Olesya Petrovych noted that any dam on the river means great harm, because the fish cannot move freely and lose access to natural spawning grounds, and water quality inevitably deteriorates due to the fragmentation of the river and the slowdown of flow. As part of the E40 Project, there will also be a dramatically increased risk of invasive species penetration through shipping directly from Black Sea to the Baltic. Alien species are responsible for long-term changes in the biotic and abiotic components of the habitats and ecosystems, affecting trophic chains and successional processes, transforming the natural characteristics and functionalities of habitats and altering the natural dynamic of the ecosystems. The representative of the State Agency of Water Resources Irina Voytyuk drew attention to the fact that the Laws “On Strategic Environmental Assessment” and “On the Environmental Impact Assessment” now operate in Ukraine, and the E40 Waterway Project should be considered in accordance with the procedures defined by these Laws. Environmental losses ought not to exceed the economic benefits. Svyatoslav Kurulenko, President of Environmental Auditors Association of Ukraine, noted that the E40 IWW project should be evaluated on the basis of sustainable development of Ukraine, within the framework of the current legislation and with observance of the approved procedures, and while the formal procedures are not implemented, the project cannot be implemented. The project must be discussed with the Belarusian and Polish partners and even beyond through its potential impact on the Black sea and the Baltic. Dr. Svitlana Boychenko from the Institute of Geophysics of the National Academy of Sciences of Ukraine stressed that the environmental benefits of the E40 Project for reducing CO2 emissions compared to road and rail transport, indicated by the project’s developers, are speculatively used as an argument for the project to prove ecologically attractive. It is necessary to take into account the reduction of precipitation in recent years and the threat of water pollution as a result of the operation of the waterway and in the event of man-made accidents. In his concluding remarks, Ruslan Havryliuk called upon all those present for further cooperation and continued consideration of all aspects of the E40 Inland Waterway Project in order to inform the wider public and authorities about the threats that it poses to the unique ecosystem of Polesia.